Enjoy a day out to the Niagara Region. This tour is fully narrated with a licensed driver and tour guide. Experience the breath-taking Niagara falls and an unobstructed 360 degree view of Niagara atop the Skylon Tower. This tour will also give passengers the opportunity to explore the city and have time for lunch and souvenir shopping. After departing Niagara falls we will travel along the famed parkway to Niagara on the Lake and stop at a local winery to sample some of the regions wines. This popular tour includes a complimentary pick up from most downtown Toronto hotels before your tour starts from one of our professional drivers and licensed guides. Our guides and drivers are experienced, knowledgeable and offer a truly unique tour sharing with you the amazing history and fascinating facts about the area. Departure begins are 9 am as we journey around Lake Ontario passing the famous credit river, the green and luscious city of Hamilton, St. Catherine’s, and the Welland Canal leading into Niagara Falls.Your tour guide will orient you with the falls and then you will have free time to explore. 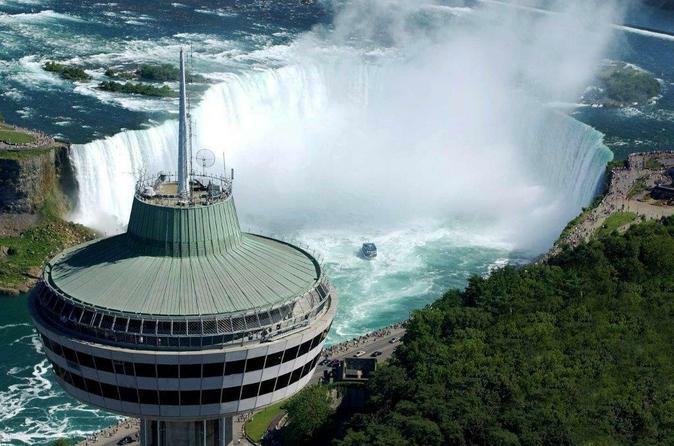 Experience the best views of Niagara Falls from atop the Skylon tower, included in the price. After a fun and adventure filled day at the falls, return back with your tour group along the Niagara Parkway. On this route, you will have the opportunity to take pictures and learn about the rich history of the war of 1812, Whirlpool Rapids, Laura Secord’s homestead, Sir Adam Beck power stations, the Floral Clock, Queenston Heights, Mackenzie House, the smallest church in the world, and the historic Fort George.VIP tours offers small and intimate group sizes and the perk of bypassing long lineups on busy days. Last but not least, we take you to Niagara-on-the-Lake where you have more free time in this authentic, historic town. There’s much to do in this quaint town while you witness the breathtaking view of Lake Ontario. Take a ride on a horse and cartridge, enjoy a leisurely walk with a coffee or try some of Canada’s best ice cream!Before we take you back to Toronto, we will stop at a local winery to sample some of Ontario’s finest wines.